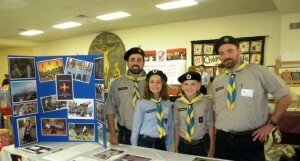 2012 April | Federation of North-American Explorers | Semper Parati! However good a Catholic and Explorer you may be, you may take it for granted that you ought to be a great deal better. There is no danger of your becoming perfect in this world; we all have a long way to go before that — most of us a very long way. And considering all the grace and help God gives, you have not covered too much of the ground — less perhaps than many whose chances have been fewer. Possibly you may even have gone the wrong way now and then, in spite of the [×] which God and His Church have put plainly right before your eyes. But in any case the important thing is to keep on trying, and trying hard. It is to help one another to do this that we are Explorers, because it is much easier to work together than to work alone. And as we work together, let us pray together that God our Father may help us all. Almighty and merciful God, in Thy goodness put far from us all that may work us harm; that, alert alike in mind and body, we may loyally devote ourselves to the doing of Thy holy will. Amen. It is put down somewhere else in this book that printed prayers are meant to help us to pray — we can pray without them and often do, but sometimes a book is a help, because it puts into our minds the right kind of thoughts, and the right kind of wishes into our hearts; and that is the great thing in prayer which, as you know, means raising up our minds and hearts to God. A rosary is a whole prayer-book in itself, and much easier to carry about; and it can be used at times and in places where a book is out of the question. 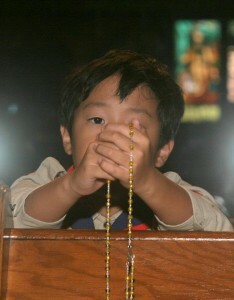 You know how to use your beads, and if you just think, you will see how they come to be as good as a prayer-book. The Rosary is, of course, a prayer to our Lady — it is made up chiefly of “Hail Marys.” But when we are saying it we are really getting our Blessed Lady herself to teach us about the life and death and resurrection of her Son, and thus to put into our minds the right kind of thoughts, and the right kind of wishes into our hearts. You know the fifteen “mysteries” of the Rosary, and how they bring before us what our Lord did and suffered for our sake. Thinking of them makes us remember His goodness and love for us, and the example He set for us to follow; and we wish that we could love Him more, and that we had not offended Him, and we make up our minds to try and serve Him faithfully. These are the right kind of thoughts and wishes, and all the while our prayer is being offered to our Lord by the hands of His Blessed Mother, who helps and pleads for her children who love and honour her for Jesus’ sake. O God, Who hast poured the gift of charity, by the grace of the Holy Ghost, into the hearts of the faithful: grant to Thy servants, the Explorers, for whom we implore Thy mercy, health of mind and body; that they may love Thee with all their strength, and with all their hearts accomplish those things which are pleasing to Thee. Through Christ our Lord. Amen. O God, bountiful of forgiveness and lover of the salvation of mankind, we beseech Thy clemency for our brethren who have departed this life; that by the intercession of Blessed Mary ever a Virgin and of all Thy saints, Thou wouldst admit them to the brotherhood of everlasting happiness. Through Christ our Lord. Amen. 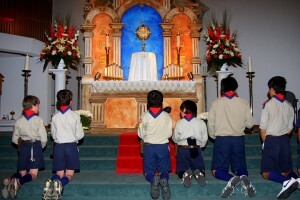 Every Catholic Explorer should be ready to serve Mass whenever he can. 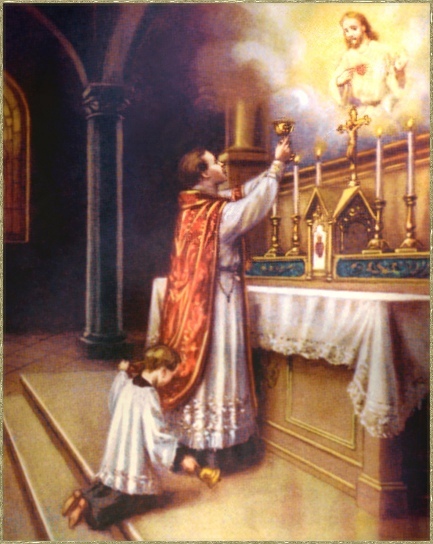 It is often a “good turn” to the priest, who may not find it easy to get a server. But it is a great deal more than that. It is an opportunity of doing a “good turn” to our Lord Himself, Who is really present on the Altar to offer the same Sacrifice as that offered on Calvary long ago, when He died for us. No real Explorer would miss a chance like this. But he must not only be glad to do it, he must know exactly how it ought to be done. The words and ceremonies of the Mass are to be found in many books, and therefore they are not put down here. You probably know them more or less already, and if not it is well in any case to get someone to teach you. But it may be useful to mention one or two things, which are sometimes forgotten. Everything must be done, not only correctly, but with reverence. So be careful not to hurry over either what you have to say or what you have to do. Speak clearly and distinctly, and move about quietly. Start in good time for everything, so that you may not be hurried. When your hands are not otherwise occupied, keep them joined, palm to palm, in front of you. When you have to ring the bell, do so as gently as possible. Make your genuflections slowly, keeping your body upright, and touching the ground with your right knee. Remember always that you are very near to our Blessed Lord, and that you are taking part in the great Sacrifice which He offers for the living and the dead; join as well as you can in the offering He makes, but do not distract your attention from what you have to do by trying to say prayers out of a book. At the beginning ask Him to help you to serve Mass well, and at the end thank Him for letting you do it. There are lots of people who never get the chance. 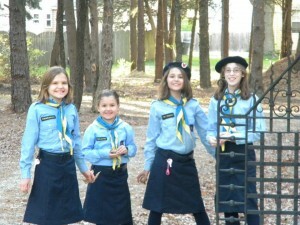 On Saturday, April 21, 2012, the Federation of North-American Explorers – 1st North Star Group took part in the annual C.H.A.P.L.E.T. (Catholic Homeschool Association with Papal Loyalty Educating Together) Homeschool Conference at Mater Ecclesiae in Berlin, NJ. We were busy for much of the day and managed to “get the word out” about our movement, our principles, and our mission. Of course none of these things can be easily broken up into soundbites or brief talking points; it was gratifying to see how people were willing to stay and chat long enough for us to deliver our message. There isn’t anyone else in the country at the moment who is doing what we’re trying to do, which is to present the Faith in an innovative program based on Baden-Powell’s original principles (which have always been approved by the Church). Six of our Timber Wolves, three boys and three girls, joined us for the day and provided a great example of the Explorer Law: “An explorer is courteous and chivalrous.” They were helpful in every aspect of the conference, from setting up the table and breaking it down, to volunteering with the food service. But most of all, they set examples of how Christian ladies and gentlemen should conduct themselves. We would like to thank all of those who took the time and trouble to talk to us on Saturday. We would also like to thank the organizers of the CHAPLET Conference who went to great lengths to accommodate us. Hopefully we managed to pique your interest in our movement and what it stands for. Please keep us in your prayers!